Slowloris is a layer 7 DDoS attack that targets web servers and applications. Layer 7 is the application layer of the OSI model. The HTTP protocol – is an Internet protocol which is the basis of browser-based Internet requests, and is commonly used to send form contents over the Internet or to load web pages. Slowloris is a ‘low and slow’ DDoS attack vector. The idea with the Slowloris attack is to saturate the entire TCP stack for the HTTP/S daemon; this is done by slowly opening up connections and then sending an incomplete request in attempt to keep the connection alive as long as possible. The tool does this slowly and it is possible in some cases that a single attacking machine can take down a web server. Slowloris has a similar functionality (Or at least end result) to that of Empty Connection Flood, but with much slower rate of opening new connections and keeping those connections somewhat persistent. Thus, rate-based volumetric detection, is ineffective in detecting the Slowloris attack, since traffic volume is normally way under detection thresholds. A constantly growing number of open connection from an attacking machine (keeping those connections alive) can be considered as a high probability sign of the Slowloris attack. In image 1 you can see “client” establishes TCP connections and sends initial incomplete packages to keep the connection alive. Client establishes TCP connection to the server using 3-Way Handshake (SYN, SYN-ACK, ACK) – packets 1,2,3 and then sends a “keep-alive signal” – packet 4. Single client will aim to establish as many such connections as possible, but not to go over detection threshold. Image 2 shows 5 “keep alive” packets have been sent during a single TCP connection. 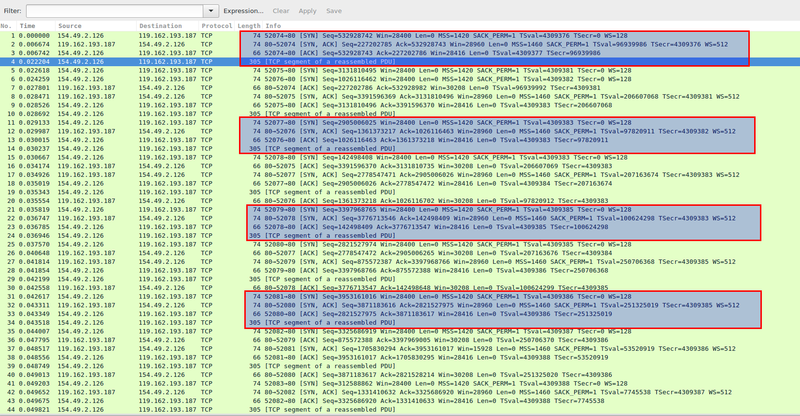 “Keep alive” packets contain PSH ACK Flags and have incomplete HTTP header. Notice that it is missing one CRLF to finish the header which is otherwise completely legitimate. Which obviously doesn’t mean anything to the server so it keeps waiting for the rest of the header to arrive. The same bogus header is resent in all 5 “keep alive” packets. Image 4 displays that the capture analyzed is more than 6 minutes long and the average number of packets per second are at 20.6, with a rate of around 0.014MBit/sec. Attack rates could be much higher. The above stats are show for a single attacker node. But, even for a massive Slowloris attack the stats per attacker will look very similar. The analyzed capture represents a more than 6 minutes of attack traffic. And, as one can see the stats are more than modest. There is no specific filter one can apply to make the Slowloris to stand out. Analysis is done by applying ip.addr == ‘suspected_attacker’ and following TCP streams. – absence of FIN packets. The figure shows FIN packets, because the attack was explicitly stopped for this example having a complete TCP stream.